The only way to drink water! I’m keen on exercise and in the past found myself going through bottles of mineral water like nobody’s business. Not only was that expensive, but terrible for the environment. I then moved on to reusable plastic bottles. I found these prone to staining and they usually left an unusual taste in my mouth. Worse, more often than not they fell apart in the dishwasher – not great for this un domestic goddess!! Then two months ago, glass water bottles with silicone sleeves (catchy, I know) walked into my life. I’ve been using this for the gym, exercise classes, at home and at work and I’m converted! This one is by the brand Apana, which appears to be mainly available in the US, but I picked this up in TK Maxx for just a tenner. There are plenty of alternatives available on Amazon too. Read on to find out why I fell in love. The water really does taste better – honestly it does! Fresher and it also stays cool for longer. I don’t think this is a placebo effect either. If you search BPA and phthalates (commonly found in plastic containers) there is certainly opinion out there that these can change the taste and quality of the water contained in them. It’s (almost) indestructible – I’ve put this through the dishwasher almost every day and it looks as good as new. Great for the clumsy ones among us – The silicone sleeve gives it amazing grip meaning even the more accident prone (that’s me!) will find it difficult to drop. Looks as good as it performs – I don’t think I’ve ever had compliments on a water bottle before! So many people have asked me where I found it before rushing off to TK Maxx to get themselves one! If I had to offer a down side, the bottles are naturally more heavy than their plastic counter parts so may not be ideal for some types of exercising including road running. Like Eucerin the sun protection from Ladival contains no mineral oils or petrolatum (ingredients that trap heat under your skin making certain skin problems including prickly heat more likely to occur). Even better, it contains no perfume or fragrance (some of the Eucerin products do but it is the last ingredient on the list so the amount is negligible). This means the Ladival creams have what I would describe as a slightly clinical smell, although not unpleasant and very subtle. One of the ingredients is titanium, intended to reflect and filter harmful rays. This means the creams, especially the factor 50, tend to leave a ‘white cast’ on your skin which might be off putting to some, but I don’t mind adding reflective skin to my poolside look which otherwise consists of frizzy hair and uneven eyebrows! The creams are easy to apply, the factor 30 more so than the 50 due to its lighter formula. Both factors need a good shake before use (which is recommended on the bottles) otherwise it tends to flake a bit but if properly mixed this didn’t occur. Once absorbed you don’t feel like you have anything on your skin, which could be a positive or negative attribute depending on your point of view, but I just use a systematic approach to make sure I didn’t miss any patches of skin. I applied this very liberally and didn’t suffer any break outs on the face or body, so it didn’t seem to clog my pores, although it’s worth noting I’m not typically prone to spots. One huge advantage the Ladival has is that I found it far less likely to stain clothes compared to the Eucerin products. So the big question, what about prickly heat? I still developed it; I’ve never been to a climate warmer than the UK and escaped it completely. However it was far less widespread or severe, and settled down far quicker than previous trips abroad. Overall, I’m pleased as punch with both these brands and will use either for my ongoing sun protection at home or abroad – the best special offer is likely to swing it for me when I next need to stock up! I bought the SPF 50 and SPF 30 in 200 ml bottles for £13.50 each, on a ‘buy one get one half price’ offer. You have probably noticed Nandos has a bit of a cult following. I definitely consider myself one of it’s loyal devotees! 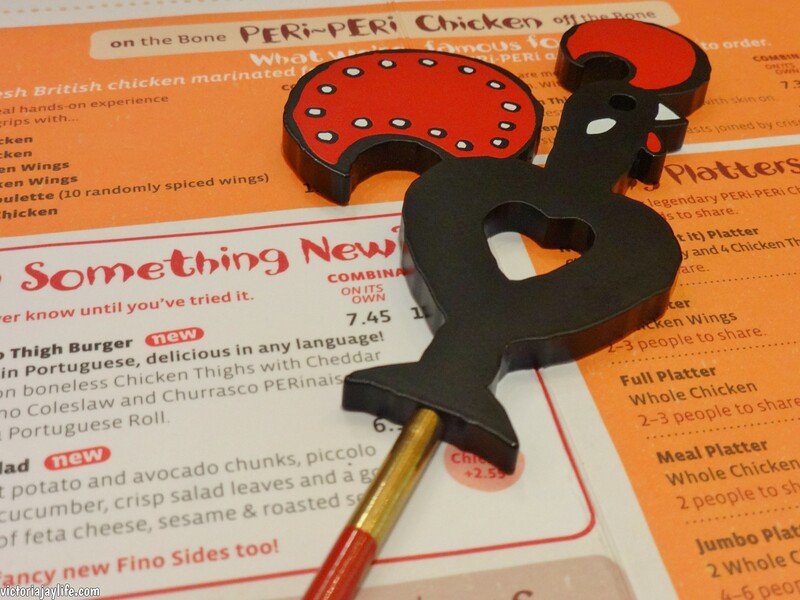 In fact (and don’t judge me) we have coined the phrase ‘Nandos Wednesdays’ in our household which is exactly how it sounds – on Wednesdays we eat at Nandos! However, we reserve our treat meals for weekends and even though we eat at this restaurant almost every week, we go straight from the gym so still want remain conscious of the nutritional value of our choices. Seeing as we created ‘Nandos Wednesdays’ almost a year ago I have managed to work my way through a lot of the menu and now have a few favourite combinations that both taste good and fit into my weekday healthier eating habits. Read on if you want to know what they are! All nutritional values listed are calculated using information from the Nandos webiste. The chicken butterfly is a great choice for those who prefer not to eat their chicken on the bone. It is also big enough so that when you add the two vegetable based sides the meal still leaves me satisfyingly full and I am pleased to have got two of my five-a-day in! 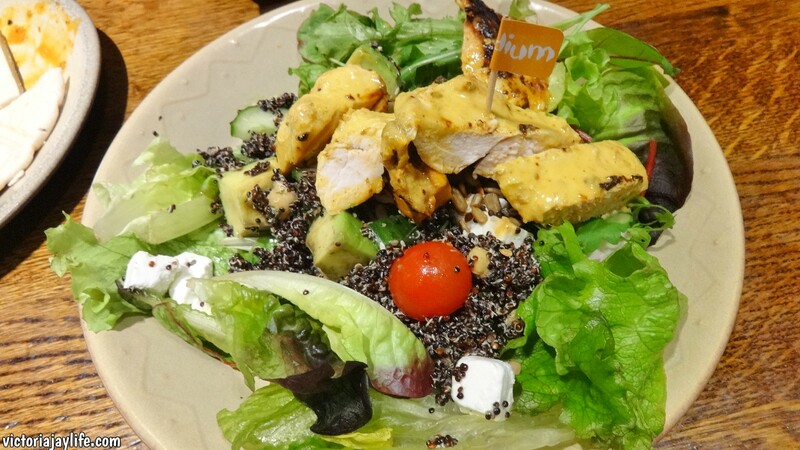 Salad at Nando’s?? I know but trust me this is a good one. It also has to be said that it tastes far better than it looks! The quinoa, sweet potato and avocado make this tasty as well as filling so I am never disappointed when I order this. I know – a second choice with the chicken butterfly but it really is my favourite chicken main on the whole menu! 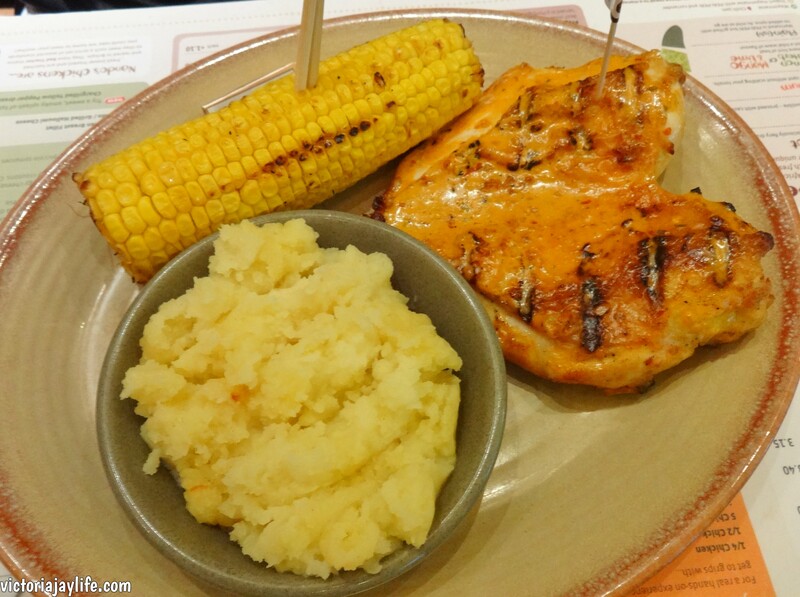 I wasn’t always a fan of corn on the cob but the sweetness of this side goes well with the Peri Peri sauce, and I find it takes me a long time to eat giving me the chance to get more full. And you can’t order sweetcorn without mashed potato, but the sweet potato option makes it a healthier choice. 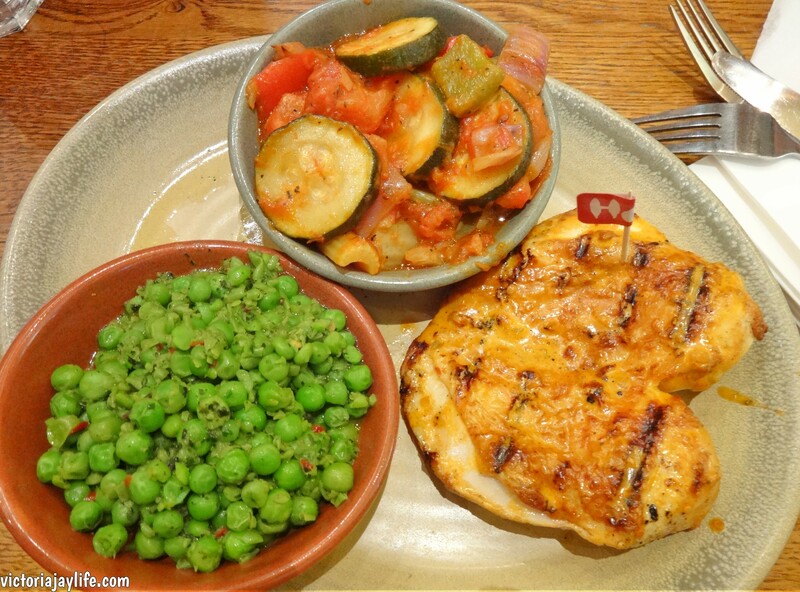 If you have any of your own favourite Nando’s combinations let me know in the comments! 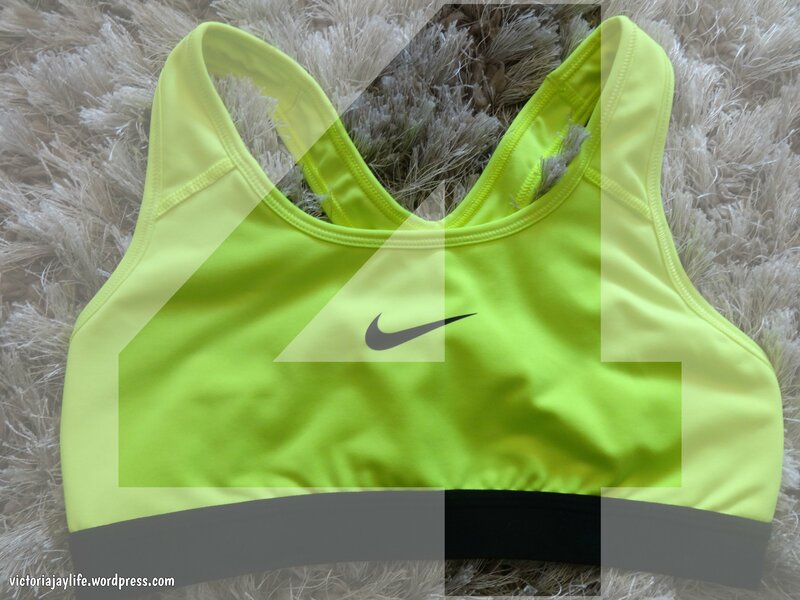 4 Motivation Tips – to get you to the gym! Whether you are going to the gym for weight loss/gain/maintenance, fitness, strength or any other reason the chances are (if you are anything like me) there are times when you really can’t be bothered. For me, on those days I seem to be able to think of 100’s of reasons (or actually excuses) not to get myself to the gym. Having said that I’m pretty impressed with myself as in the past couple of years I have been going consistently so I thought I’d share my motivation tips with you today. I’m not saying a gym membership is the only way to exercise (you can read my post about my favourite at home workouts here) but if you already have a gym membership you are bound to want to get your money’s worth! I have a 9-5 job (what a way to make a living!) and I find the best way to ensure I get to the gym is to go straight from work. Do not pass go, do not collect £200! I pack a gym bag in the morning (or the night before) and throw it in my car so that I have no need to go home first. If I do, once I’ve kicked off my shoes and sat down that’s it – not much is going to get me off my bum and out the door after that! When I worked shifts, I made sure to go after early shifts or first thing in the morning on days off. Obviously when is best for you will depend on your personal circumstances, but I recommend you find a time that means you are less likely to slack off, and make it part of your routine. I’m one of those people who always seems to be hungry and for me working out when I feel that way is never effective. I know some people like the ‘starved cardio’ technique and to be honest I don’t know much about it but I do know it’s not appealing to me! So as I go to the gym straight from work I now make sure I have a proper breakfast and a more substantial lunch than I used to, or have a healthy snack at work part way through the afternoon. If I leave work without a rumbling tummy I’m definitely more inclined to get in my car and drive to the gym instead of to the nearest shop for food! You can read about my healthier breakfast choices here. I used to wear any old thing to they gym. Usually leggings and baggy t-shirts that I’d had for ages and weren’t ‘good enough’ to wear for anything else any more. I’d heard people say this was a bad idea and you should wear work out clothes that made you feel as good as your other clothes. I dismissed it thinking I’d rather spend money on other things but then I finally realised the error of my ways! I find workout clothes made by proper sports brands not only fit better, feel more comfortable and last longer but actually make me look forward to working out (yes really!). I now put the same effort into selecting my outfits for the gym as I do into any other outfit and I can honestly say this is one of the things that gets me to the gym regularly. Most gyms have a range of classes to chose from. I find taking the plunge and going to my first one is a bit nerve-racking but I have always ended up enjoying them. I find there are a few reasons why going to a class improves my motivation. First of all trying something new and therefore mixing things up at bit definitely spurs me on. The fact that you have to be there at a certain time also means I’m less likely to make excuses or put off going. Finally, once I get to know a few of the regular faces and the instructor I feel guilty for not going so tend to turn up!